When I started my company, I decided that I needed to create a strong social media presence. I searched everywhere for ‘tips and tricks’ and I started a notebook with all of the information I found. This notebook was a concrete, comprehensive plan, but it was overwhelming! I decided to start with Instagram because I thought I was familiar with it. After a lot of work, blood, sweat and tears- I walked away realizing that I knew nothing. I did something that truly ruined my account and eventually led me to delete my entire Instagram account and start over. 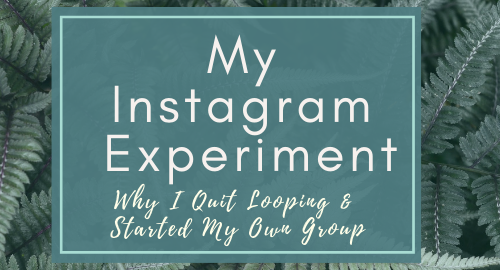 So, I’m here to share my experience and expose the Instagram Loop Truth. An Instagram Loop is a marketing and network strategy that is running wild on Instagram today. Most of the more successful loops are based on your niche- mom, blogger, home decor, fitness, handmade businesses etc. Some are for all page types and some require that you have a certain amount of followers before you can join. To join a loop, you either message and admin or join a loop group. The admins will share a picture and a caption to go along with it. At a certain time of day, you will post the picture and the caption. The caption has instructions for how to participate. The rules usually require you to follow the hosts of the loop, follow the followers of a page, follow everyone that posted the loop picture… and sometimes they want you to comment an emoji on every single loop picture…. In short, you’re posting a picture and reaching out to everyone who posted the same thing. You’re supposed to follow everyone who follows you and they’re supposed to do the same. The average loop requires about an hour to do everything they ask- but they all require different levels of engagement and the loops run for different lengths of time. If I said that I regretted trying loops, it would be a lie. It was the biggest learning mistake I’ve made and it helped me grow. Looping got me to 2,500 followers in less than a month. Granted I ended up deleting the entire account, the experience made me grow as a person. I’ve made a handful of really close, legitimate friends from looping. Mainly, I grew close to the people who looped and failed out like me. Anyways, I heard about looping from one of my friends. I asked her about it, joined one and I got hooked. Like… legit addicted to looping. I was running one, maybe two loops per day. I definitely got a bit carried away with it. It was so satisfying to see my followers go up by the minute! I was growing…and SO fast! Most people become loop admins to benefit their own page. The rules usually say ‘follow the admins’ and then another list of people you have to follow. Listen up: they will not follow you back. They are an admin so that they can have 16,000 followers and only follow 100 people. Yeah…. no…. Instagram’s algorithm is a computer, not a highly emotional person. They are tracking stats on your page that you don’t even know that they’re tracking. They are well aware of looping and know exactly what organic growth looks like vs fake loop popularity. Not only is it obvious to Instagram, any potential follower will notice too. My old account had 3,000 followers. I averaged 30-40 likes per photo. My current account has less than 200 followers and I get 70-80 likes per photo. I was so new and so green to Instagram. I didn’t know any of the tricks or crazy back bends you had to do if you ran a business account. Panicking, I messaged a friend I had made on Instagram. I asked her why I was basically breaking even with my loop followers. I followed 50 people… and the next day, I had the same amount of followers. Those 50 people were gone. My friend asked if I had an analytics app. It shows you post engagement, audience insight and how many pages have un-followed you. Welp… honestly didn’t even think about that part! I was too excited about the followers.. Curiosity was killing me, so I downloaded the app. I watched my un-followers number go up right along with my followers number. People were un-following me in droves! It didn’t make sense! What did I do wrong? I was so upset and confused. Maybe, I took it a little personal, but it’s just part of it. I went into this with completely pure intentions… how naive of me to think that others were doing the same…. To be honest, unfollowers are just a necessary evil of looping. Fake people, spammers and fake accounts have learned that the people in loop groups will basically follow back any account that follows them.. so they prey on loopers. Looping is basically shooting fish in a barrel for a spam account. They go to the hashtag, follow everyone and then go back in 24 hours and un-follow everyone. Most people don’t notice they’ve been un-followed, so that account gets to keep you as a follower. So sneaky and just UGLY! The follow to un-follow scam isn’t the only one out there. If you start to loop, you’ll notice the scammers coming out of the woodwork. I have yet to find out how these spam accounts are worthwhile to whoever is running them. Maybe they do trick some people out of money? Or maybe they do it to funnel traffic to their real pages? I still don’t get it and it bugged the hell out of me. Instagram knows that these spam accounts are EVERYWHERE, and they know that we hate seeing them! Instagram is working tirelessly to stop the spam accounts. While reporting them can help put them on the radar for Instagram to delete, Instagram is approaching it from an easier side. They’re changing the algorithm. Making the spam pages less visible or by limiting their exposure with the algorithm is obviously the easiest route for Instagram. It’s easier for Instagram to change the algorithm than hire extra people to go through and review every flag reported on an account. Logically, anything that Instagram does to stop or slow spammers…. will also affect the looping pages that they’re leeching off of. The algorithm is basically a giant mystery (for a good reason- or everyone would exploit it). 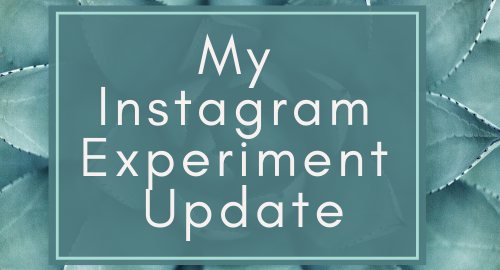 After reading a bunch of blogs speculating on the Instagram algorithm, I did some digging of my own. I messaged some friends with personal accounts that followed me and some that didn’t. The ones that were following me said that after I started looping, they were seeing less of my original content on their feed. The people who weren’t following me said that NONE of my posts were showing up under the hashtags I used. After realizing this, I lost my mind. I talked to a few loop admins and tried to get their input. Pleading, I asked them to check their accounts too. Nope. I was basically ruled as a conspiracy theorist and a wackadoo…. then ignored, blocked and blacklisted. Cause just saying ‘no thanks, I’m not interested in hearing your ideas‘ is just too grown up! It’s not so much a conspiracy as it is fact. Instagram watches the actions of the spam accounts and takes note. For example, many spam accounts use bots to message you immediately after you follow the page. So, Instagram started to punish pages that use this same bot OR bulk message people after following. Some loop groups are basically the tech version of ‘Mean Girls’. The craziest thing I have learned from looping is: people are caddy. I’ve been un-followed because I joined a loop that one loop is at war with. I was actually completely blocked for leaving a loop because I couldn’t post at the time they required. I’ve been yelled at IN ALL CAPS for being in a loop but not liking someone’s pictures… which wasn’t even required. All I’m saying is: prepare for drama! Many loops have you join an app called Telegram to join the loop group. I’ve seen full blown name calling, hair pulling cat fights in Telegram all because someone accidentally un-followed someone…. then followed right back. People in the loops with me were there for the same reason I was: to gain more followers. They’re busy growing their page and increasing their reach. Most of them are not there to make relationships, they want that number! I learned that being loop friends is basically like a one night stand. Just a notch on their bedpost…and they don’t want your phone number. Blog after blog shows that the only way to truly organically grow your account is engagement. This means having people actually look at your photo before ‘mass liking’ all of the pics under a hashtag. Real engagement means having your audience clicking to see what your bio is all about. True, meaningful engagement means people commenting genuine input on your photos. Not just ‘nice’ or ‘cool’ or a heart emoji. It means legitimate engagement from people who like your content. Lots of loop groups have separate engagement groups that run parallel with it. However, you have to use just a little common sense and consider what those look like to the algorithm. If Instagram sees the looping page itself as a spam account… what do you think Instagram will compute if all the same people also comment on each others’ photos. Do you think Instagram knows that it isn’t organic engagement? We like to hope that they don’t… but let’s be honest, they are way ahead of us. Not-so-fun-fact: for the first 3 months your page is active, you basically have a ‘governor’ on your account. You are flagged if you go above certain amount of likes, comments, follows, posts per day or hour. All of the sites I’ve found say that the limit is slightly different. However, they all agree that a new page following 60 new pages in 5 minutes is a no-no. Liking those same pics and commenting an emoji on them all is just the icing on the cake! By looping, you basically blew an air horn and waved a flag in Instagram’s face. It also says a lot that you gain a lot of followers and have zero interaction with them other than the original like, follow and comment. If a 3 month old page has 3,000 followers and zero interaction with most of those followers…. Again…. can we just use some common sense and be real with ourselves? The day after I downloaded the Followers app, I saw a real-life friend had unfriended me. WOW! That is a crappy feeling! It was killing me to know why she did it. Did I upset her? Was my occasional curse word offensive to her? It shouldn’t be… she knows me in real life! All of the comments for the loops was bogging down her activity feed and basically…. I became spam to her. My results were way off point! People who knew me face-to-face were tired of seeing my posts. I wanted people to see my crafts, pets and funnel traffic to my blog. I ended up being seen as a stock photo annoyance. People weren’t associating me with what I wanted my page to mean. Your typical user is going to have 200-300 followers. 150-200 are going to be people they are friends with in real life. That means you have to work hard and post some stellar content to hang in on someone’s daily feed and be seen as legitimate. By looping, I ended up like the U2 album that randomly showed up on your iPhone. Annoying, but not enough of a hindrance to remove. Did you hate it? No, but did you ever listen to it? Uh hell no. No one wanted to listen to me. After I realized what my friend meant, I started to panic! If people see me like that, what does the algorithm think of my page? Do they associate me with the spam accounts? Even if I haven’t done any lasting damage to my page…. have I done what I set out to do? Establish a brand, create a name, build a reputation, send traffic to my blog, get custom orders…. have my followers trust my opinion. No…. I failed in following through with the entire purpose of my social media accounts. So… what now? All of these epiphanies felt like running into a brick wall going 90mph. For a while, I felt like I had it all figured out and I had the secret to Instagram success. I saw followers and I immediately felt successful. In reality, my success was the equivalent of being handed a wad of Monopoly money. It made me feel good, but was virtually meaningless beyond that. It was a super hard pill to swallow. All of that work, all those wasted hours…for a bunch of fake followers? And what did I do to my account? Do I need to start over? How do I gracefully back out of all these loops I joined? Ahhhhhh!! I stopped for a second and took a breath. I searched what to do if you’ve been shadowbanned. Basically, they say to log out of the account for 3-4 days. Remove all apps, bots, post helpers that are linked to your account. Delete any archived loop posts. I removed all of the junk loop groups (I kept my tried and true groups). Then, I unfollowed the spam accounts I had followed- talk about time consuming– whew! In December, I deleted my account and started over. Every tip, trick and hack couldn’t get my account back from the abyss. Even my most stellar content was only getting 20-ish likes and a few comments- mainly only from my Hashtag Tribe. I posted graphics on my story and feed for ONE WEEK telling my followers to follow my new page. I think about 60 people from my old page voluntarily followed my new page… again, mostly just my Hashtag Tribe and real life friends. I think THAT RIGHT THERE is enough to prove that my old account was junk and worth deleting. Trust me, I was a sweaty nervous mess when I pressed delete. You can follow my new Instagram here! It may be tiny, but I’m doing it right this time and it’s SO SO worth it! 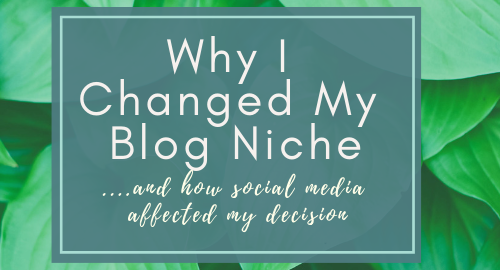 I’m finally getting traffic to my blog… which was the whole stinking purpose behind joining Instagram in the first place! Also, I started a group of my own…with all the information I had learned the hard way. In an attempt to revolutionize the way we network, I created an entire blogging community that is different from anything you’ve ever seen!. You can read more about it here. Maybe my story can save you a little heartburn and teach you how to grow the right way! Since posting this, I have been attacked multiple times for speaking out and trying something new. I have been threatened by some sketchy loop admins to shut my page down or they’ll ‘shut it down for me‘. I’d like to put them on blast for being so childish, however I’m not petty like them. All of this drama has been more validation that loops are a bad idea. Obviously, I’m striking some nerves. Many of them have said ‘there’s no such thing as a ban‘ or ‘hashtags aren’t regulated‘. They said my theory behind starting this is based on lies I’m spouting to scare people. Okay… please don’t believe me. Go research this theory for yourself. Use common sense and think it through. Do some leg work and do some digging of your own. I know it’s easier to stick your head in the sand and act like nothing is happening, but there’s a reason for the saying ‘there’s no such thing as a free lunch’. Don’t believe me or them. It’s your account and I really don’t want you to put it in my hands out of blind faith. Because I can promise you won’t find any legitimate facts stating that looping is good idea…. O.M.G. this was a life saver! I swear Instagram is now a full time job! Who has time to go through all these tricks & algorithms….Love this post. It was so helpful and insightful! Thank you, sweetheart!!! I just thought it was about time someone talked about it, ya know?! ?